Home » Stone Cleaning » Read This Before Replacing Your Tile! Should I clean or replace my tile? We’ve had many clients tell us that they want to rip out their tile because they hate it. But we say “NO! Don’t do that yet!”. We may just have a better solution for you. Usually tile itself doesn’t wear out. Is it possible? Sure, but usually it doesn’t. Usually it is the grout lines. Grout is porous and made of cementitious materials. Ceramic or porcelain tile itself is glazed and has a baked on finish on top of it, which is really hard. Porcelain is harder than even ceramic. So if a client doesn’t like their ceramic or porcelain tiles, sure they can get it replaced. However, we recommend our Grout Color Renew service before getting it replaced. The best thing is to have us clean it and see what it looks like. Especially see how the grout looks like because it’s porous and holds most of the soil. After we would clean the tile and grout, we would put on a color seal on the grout lines. We call this our “Grout Color Renew” service. Grout color renew actually changes the color and also reduces surface tension. Again, grout is really porous, so dirt and soil gets collected into those pores of the grout line. When you change the surface tension, that means it puts a finish over top of it that looks like grout, but doesn’t allow anything to soak inside. It repels water and oil extremely well. 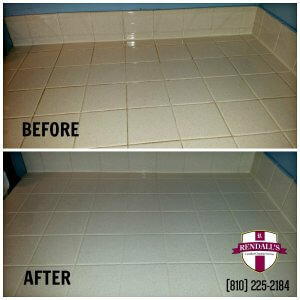 With this simple solution, we can “renew” your grout and make your floors look fantastic again. Would it be more cost effective to get my tile and grout cleaned or replaced? Will it be cost effective to get it cleaned? Yes, absolutely. If you get it replaced, not only do you have to deal with pulling out grout and putting it back in, you still need to have a sealer applied on top. By the time you add up all of those costs, the full cost to get it replaced will be substantially more than the cost of cleaning. There are some companies that will cut out the grout lines and replace all the grout. The problem is even if you do that, it still would absorb soil, dirt, and everything else; It would still need to be sealed with a color seal, even on brand new grout. If you really hate your grout and needs a lot of help, you don’t necessarily have to replace it. However, if it’s just ugly as in it’s soiled, beat up, and needs help, we always recommend the Grout Color Renew service. For more information, check out our Tile and Grout Cleaning page! Informative blog post, thanks for sharing! Tile and grout cleaning is way better than replacing your tiles indeed! ‘Grout color renew’ makes our bathrooms look new again. It’s a smart choice and costs way lesser than replacing tiles as well.